16 February 2016, Horw, Switzerland: Toradex is pleased to announce the availability of a Technical Preview of Windows 10 IoT Core on an ARM®-based System on Module (SoM). 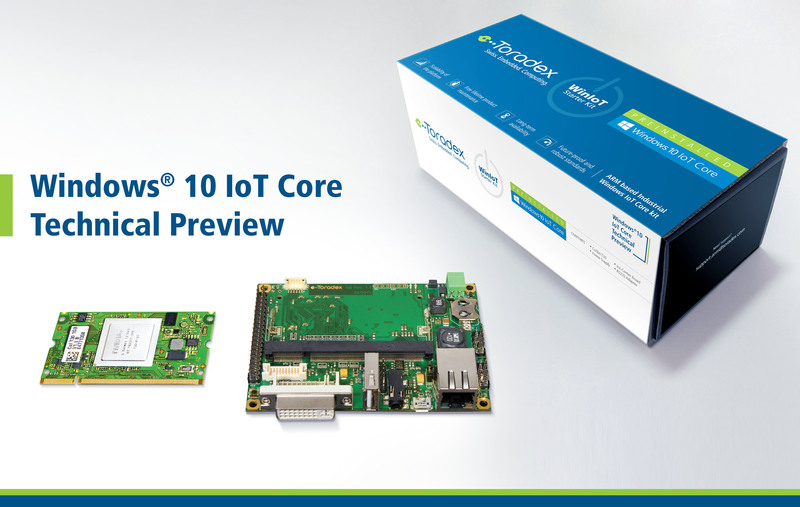 The Technical Preview is designed to test and evaluate the new features of Windows 10 IoT Core on an industrial grade embedded computing platform. To kick start the evaluation, Toradex offers a Starter Kit for a limited time at a promotional price. The kit comes with a Colibri T30 SoM and Iris carrier board plus required accessories. This Technical Preview is based on Colibri T30 powered by NVIDIA®’s Tegra 3, a powerful ARM Cortex-A9 Quad Core embedded processor. Colibri T30 supports accelerated DirectX® graphics, provides low level hardware access, and is part of the Azure IoT Certified Program. Looking at other ARM-based products supporting Windows 10 IoT Core, one key differentiator is that Toradex computer modules are designed to be used in industrial end-products. Today, Colibri modules are being deployed successfully in customer applications targeted for Industrial Automation, Medical, Automotive, Point of Sale, Defense and many other verticals. The Technical Preview is limited in terms of features. Over time, Toradex intends to extend features and add Windows 10 IoT Core support for its other ARM-based SoMs, based on customer feedback. Details on the feature limitations can be found at http://developer.toradex.com/winiot and more information on Toradex’s strategy for Windows 10 IoT Core can be found at http://developer.toradex.com/knowledge-base/toradex-windows-10-iot-core-pro-strategy. At the upcoming Embedded World, 2016 on 23-25 Feb, Toradex will be showing multiple demos on Windows 10 IoT Core and Azure IoT, at booth 1-639, Hall 1. Toradex engineer, Valter Minute, will be giving a talk on “Windows 10 IoT Core: From the Embedded Device to the Cloud and Back”. A recorded webinar on “Introduction to Windows 10 IoT Core” is published at https://www.toradex.com/webinars/introduction-to-windows-10-iot-core. View a Toradex demo showcasing face tracking on Windows 10 IoT Core here.